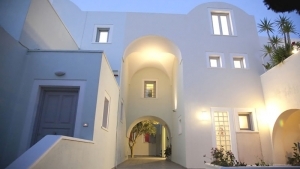 Aria Suites is a 4 star boutique hotel, located in the center of Fira in Santorini, providing guests a combination of private and luxury accommodation. 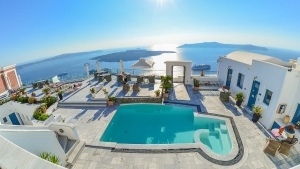 The six luxury suites, situated on the caldera, in a magnificent and quiet location, only steps from the nightlife, provide guests with simple yet exquisite Cycladic luxury. 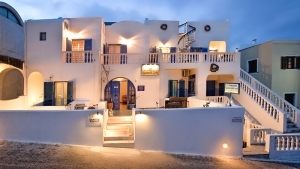 All suites are fully equipped with air condition, fridge, mini-bar, laptop, free wireless internet access, satellite TV, CD and DVD player, pool towels and natural bath eco products by Korres. Aria Suites provide guests with concierge assistance and with 24 hour front desk service. Massage therapies and beauty treatments as well as special or candlelit dinners can be arranged in the privacy of the suite, upon request. Bar, 24-Hour Front Desk, Newspapers, Terrace, Non-Smoking Rooms, Safety Deposit Box, Luggage Storage, Air Conditioning, Snack Bar, Sun Terrace. 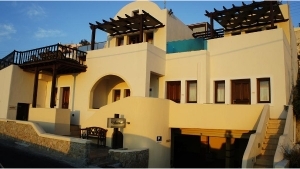 Activities: Outdoor Swimming Pool, Fishing, Hiking, Cycling, Diving, Horse Riding. Services: Room Service, Babysitting/Child Services, Laundry, Breakfast in the Room, Ironing Service, Bicycle Rental, Car Hire, Tour Desk, Fax/Photocopying, Shuttle Service (surcharge).